Storing our sales materials centrally eliminates the uncertainty of not knowing whether documents are up-to-date. With the help of SAP’s standard reports, everything our sales department needs is now always up-to-date and available on mobile devices. Niehoff Sitzmöbel offers its customers a wide array of dining room furniture. Whether looking for something modern, classic or romantic, customers assemble their own collection with the support of a sales representative. Employees invest considerable time into thoroughly assembling customer-specific documents and information to meet our high quality standards for customer support. 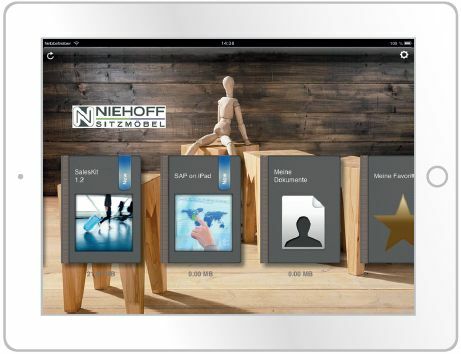 When Niehoff Sitzmöbel decided to use tablets and the it.mobile SalesKit app, its goal was to establish a structured document management system, but at the same time take full advantage of the opportunities provided to the sales team by mobile devices. These are two investments that underline the company’s forward-looking mentality. The it.mobile SalesKit app from itelligence AG, which had previously introduced a new ERP system at four company locations, provides a modern user interface for structuring and presenting content. The SalesKit app’s integrated role concept also supports structured content management. This means that different groups of people can be assigned different content. Introducing the it.mobile SalesKit app and its clear, structured processes has significantly reduced how much time is needed for preparing and conducting customer meetings today. The most current versions of documents are always on the tablets thanks to automatic synchronization. All employees are guaranteed to access the current version. All information can be complemented at any time by your own photos, videos, websites and channels, such as Twitter. The sales department can now access SAP reports for preparing customer visits much more efficiently.